Happy Anniversary Reyn Guyer! 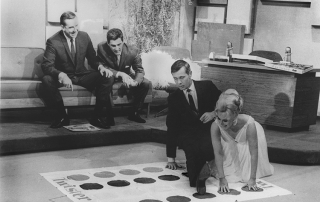 It was 50 years ago today that Johnny Carson played Reyn’s game Twister with Eva Gabor on the Tonight Show, and he was launched into Toy Creation History. Reyn, who is dyslexic, also invented the Nerf ball and was inducted into the toy and game inventors’ Hall of Fame in 1986.